when we think of mushrooms, we usually think of mario&luigi red spotted toadstools, right? there are so many more types of mushrooms, and today i pay tribute to one of my favorite classes: the bracket fungi. 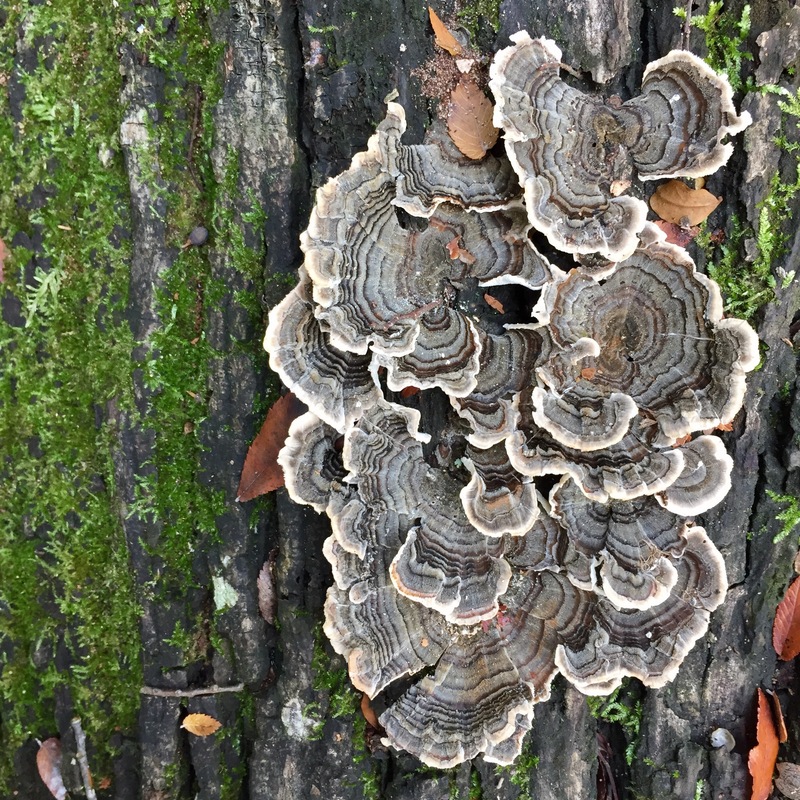 above is a beautiful trametes versicolor, or turkeytail mushroom! most folks correctly associate mushrooms with rain, and it’s true that fungus does need moisture to fruit. however, you can see brackets even in times of drought! i took this picture during a two-month drought, and look at that ample mushroom. here’s the reason why brackets stick around so long: many fruiting mushrooms (think the ones with caps) are over 90% water! when it rains or the humidity rises, the fruiting body takes in all that moisture and blooms. brackets, however, are composed of more woody growth and can even be perennials! instead of fruiting, sporulating, and decomposing quickly, bracket fungi produce a new layer of growth over the old growth, which allows the fruit to get larger and larger over time. some have been found that are over 70 years old. i learned this and much more after playing a game at my sit spot. i wrote down 20 questions about my environment. some were silly, and some were more scientific. i asked, how do bracket fungi persist for so long, even without moisture? Beautiful mushroom! 🙂 I sometimes run into these too! I just recently learned this fungus. Thanks for sharing!